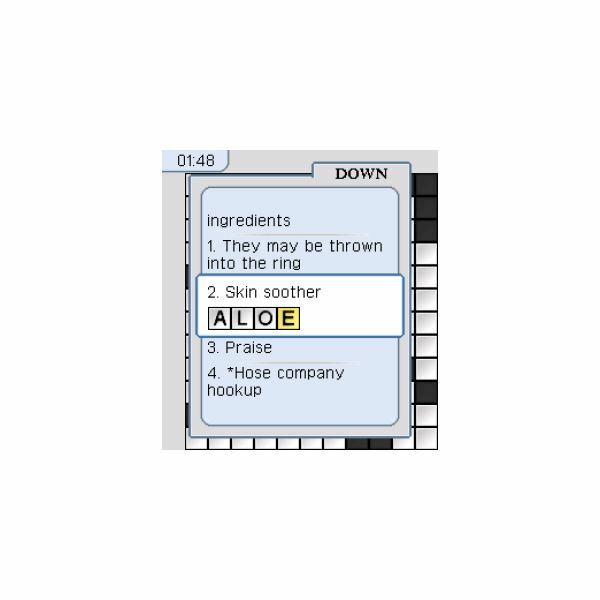 The gameboard on the NYT Crossword application is setup just like any standard crossword puzzle. I was actually fairly impressed with the graphic choices on the game, while a simple grid would have sufficed, the color choices and fonts used actually looked really good on my Blackberry Curve. 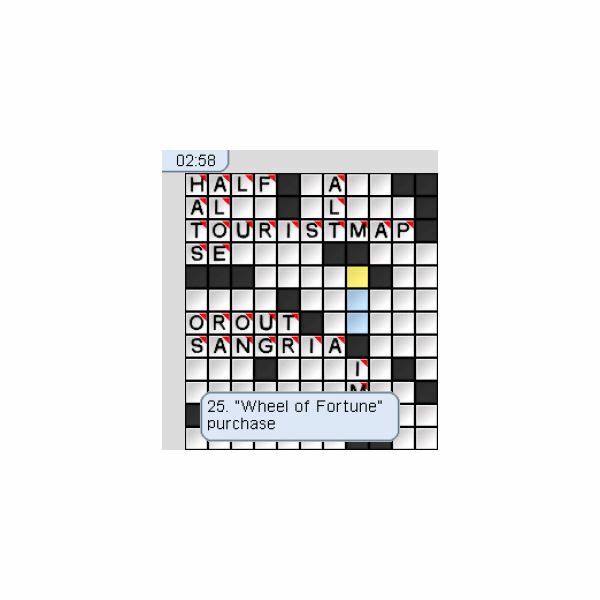 As you’ll notice from the picture above the screen also shows the highlighted area that you are attempting to solve, along with the question in pop up form. This is a great way to navigate around the screen to see each question for each area. You’ll also notice a timer at the top left part of the screen so you can challenge yourself to answer questions as quickly as possible. I also liked that I could simply go through the "up" and "down" question area and answer each question without having to navigate the puzzler. This is actually a really challenging prospect since there are no visual que’s to help with answers. 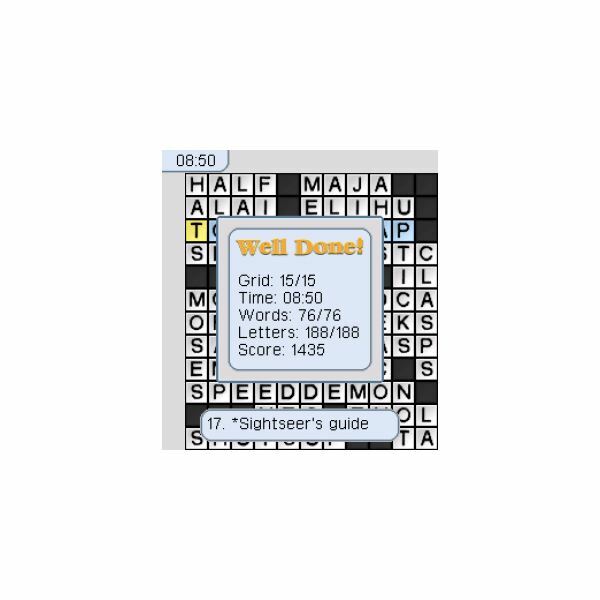 Finally, once I solved each puzzler I was provided with my correct answers total, the time it took to solve each puzzle, the number of letters used and my overall score. This is great for challenging friends to beat your scores, but honestly I only played, for obvious reasons, namely that beating my score if I already knew the words would be pointless. The navigation on the program is simple once I figured it out and sure the questions were on par with the NYT version. However at $4.99 I actually thought it was high priced considering it only comes with 30 puzzlers and no way to update those gameboards with new crosswords once you complete all of the boards. This was the biggest let down with the application. I also wish it would have offered some type of multiplayer mode so you could challenge other people to take on the same boards you’ve defeated. New York Times Crosswords – Classic Vol 1 should have included volumes 2, 3, 4, 5 and maybe even 6 in order to make it worth while. I can easily walk into a book store and pick up a puzzler book with a hundred crossword puzzlers for two to three dollars, this app wants me to accept 30 puzzles for $4.99 which I simple would not be willing to do as a typical consumer. Sure the graphics are decent and the controls are easy to master, but the game simply lacks enough content to make it worth while. I gave it a standard 3/5 review because it works as advertised, but it could have ranked higher with more included puzzles.